Hire Immigrants Ottawa (HIO) is an initiative that brings together employers, immigrant agencies and stakeholders to enhance employers’ ability to access the talents of skilled immigrants in the Ottawa area. 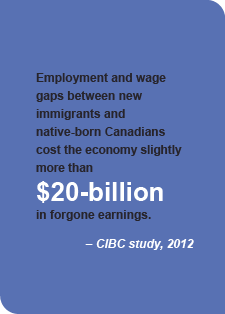 The initiative was launched in 2006 as a response to a growing need to identify and address barriers and challenges employers face in attracting, hiring and integrating skilled immigrants into the labour force. HIO’s mandate is to increase the capacity of employers in the Ottawa region to more effectively attract, hire and integrate skilled immigrants into skills-appropriate positions. 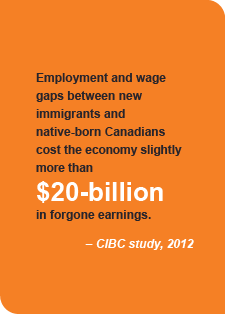 An Employer Council of Champions – a cross-sector council of senior executives from Ottawa organizations including public and private sector employers, business associations, and labour groups, that promote the effective labour market integration of skilled immigrants. Sector-specific Working Groups (Information Technology, Health, Finance, Biotech and Public sectors) address systemic challenges and barriers that employers face in their efforts to hire and integrate skilled immigrants into the workplace. Collaborates with immigrant serving organizations and other stakeholders; facilitates connections to local programs that match job-ready skilled immigrant candidates with employers. Develop tools, resources, programs and events that support employer’s capacity to more effectively attract, hire and integrate skilled immigrants into their workplaces. An ongoing campaign to increase employers understanding of the economic imperatives of immigrant’s participation in the labour force and available resources to support their efforts. Since its inception, HIO has made significant contributions to Ottawa’s labour force and skilled immigrants’ employment. The initiative has reached more than 600 employers, creating awareness, building employer capacity, developing tools and resources, and facilitating linkages with partners and stakeholders. HIO has supported the efforts of more than 200 employers to make systemic changes to their Human Resources policies and practices, including recruitment and retention practices, and cross-cultural competency building. Through HIO’s engagement and support, participating employer organizations have hired over one thousand five hundred immigrants into skills appropriate positions. Read about HIO’s Results and Impact.